While researching my latest book, Murder Capital, one of the astounding facts I discovered was that in Madison, Wisconsin’s 170-year history, only four police officers were killed in the line of duty. I say “only” because one might expect a state capital to be slightly more dangerous. The even more interesting part of this historical footnote, however, is that all four murders occurred around the time of Prohibition – for the over 80 years since combined, the level of danger comes nowhere close to the risk of patrolling in those 13 lawless years. Three of those four deaths are covered in Murder Capital. The fourth, that of Officer Edward Riphon, was excluded because it could not be directly connected to the group of bootleggers and bloodthirsty killers I was putting the spotlight on. This does not mean, however, that Riphon’s story is not worth telling. With that in mind, the following summary of his heroic death is provided in remembrance. Edward Francis Riphon was born on March 3, 1894 in the rural Dane County community of Spingdale, where he was raised by his parents, Martin Riphon and Sarah Moran Riphon, and helped out on the family farm at an early age and through his early 20s. The town was rural enough that his address was simply “on the Mount Horeb Road”[i] Even as recently as 2010, much of the town was without water and sewer facilities. By the middle of 1917, Edward was married and still working on the family farm. [ii] What made his decide to switch careers is unknown. After getting hired on as a police officer in June 1927, Riphon apparently moved into Madison gradually. The 1930 Federal Census has him boarding at 615 West Main Street without his family joining him. [iii] From his first day on the force, he was scheduled on the night shift. The most memorable moment in Riphon’s career came in December 1931, when he encountered John Schyler in the Forrest Taylor soft drink place. Schyler appeared to be reaching for a gun when Riphon intervened. After a short hand-to-hand melee, Riphon came out on top. Back at the station, it was determined that Schyler was the head of a bank robbery gang out of Fond du Lac. From his jail cell, Schyler gave up gang member Herman Ringhand. Riphon was highly commended and the pair were sent up to the state prison for 25 years. At 1:00am on May 16, 1932, Riphon made his report into headquarters from a callbox outside the Tenney building (110 East Main) on the Capitol Square. He had just finished a late night meal at Bailey’s (518 East Wilson) with cabbie Gus Wilson, just as he had many nights before. [iv] Around 1:30, he was seen by garage employee Carl Deering speaking with three men in a large, dark-colored sedan. The automobile was parked on South Pinckney, halfway between Main and Washington. When Riphon did not make his 2:00 telephone call in to Sgt. Patrick Powers, they knew something was wrong. Officer Riphon was found around 7:50am in a gravel pit on Hope Road, east of Madison. Tragically, it was 10-year Olin K. Jacobson, on his way to school, who first saw the horrific sight. Jacobson thought the man in the ditch was merely asleep, and alerted Fred Horstmeyer, who relayed the word to Julius Irvin Witte, proprietor of the Hope general store (and the nearest telephone). [v] Riphon had been shot twice, with one bullet penetrating his temple. He was apparently also beaten, as his body was covered in bruises. 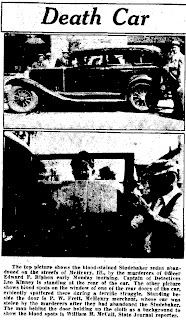 His patrol car was parked at the capitol building in the center of town, further indicating he had been “taken for a ride”. Rumors circulated that Riphon had a “black book” with the names of local gangsters and this was the cause of his death. Not long after the apparent abduction, an automobile matching Deering’s description was found abandoned in McHenry, Illinois, approximately 95 miles southeast of Madison. Today, McHenry is considered by some to be the northwest edge of the Chicago suburbs. An automobile had been hijacked near Rush Street in Chicago from Major F. O. 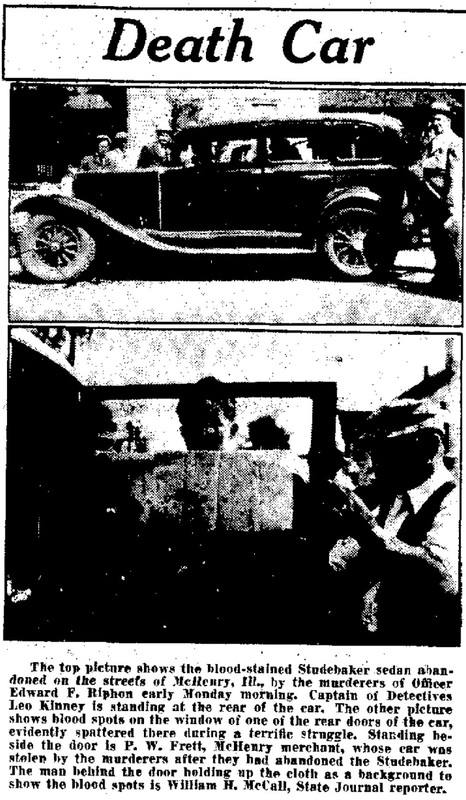 Wood of Camp McCoy[vii], and police believed this car, a Studebaker, was driven to Madison and back to McHenry before being dumped. 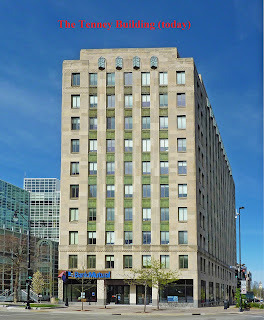 Wood was even an occupant for approximately twenty minutes before being forced out at Halsted and Fulton (in the River West neighborhood). During the ride, Wood was ordered to “look straight ahead” and had a nickel-plated .32 pointed at him. He initially described two of the hijackers as “an Italian” and “a Norwegian” who was a “darn nice looking boy”. Unknown to Wood, the vehicle continued on to Madison, stopping multiple times to change license plates. In Whitewater, plates were stolen from garage owner Max Frederick Foerster. Upon reaching Madison, they stole another set from the Studebaker of Philo Buck, professor of comparative literature at the University of Wisconsin. Probably unknown to the men, they were also parked right outside the home of Dean Charles Schlichter. The stolen plates may have been the cause of Officer Riphon’s questioning, and if so, his death may have been spur of the moment rather than anything planned or “contracted”. Despite the identification of suspects by Wood, no arrests were ever made and the Riphon homicide remains unsolved. Gavin Schmitt's Murder Capital is available now. [iv] “Police Hunt Pair After Killers Take Officer Riphon for ‘Ride’” Wisconsin State Journal. May 16, 1932. [vii] There was some confusion on the identity of Wood. When consulted, Camp McCoy knew of no such man. A Major Norman B. Wood of Two Rivers, connected with Camp Grant, existed. Whether the man incorrectly identified himself or was misheard by police is unclear. The discrepancy is covered in William H. McCall, “Bloody Auto Points Slayers’ Trail to Lair”, Wisconsin State Journal. May 17, 1932. [viii] McCall, William H. “Order Arrest of 5 ‘Bad’ Chicago Suspects in Riphon ‘Ride’ Murder” Wisconsin State Journal. May 18, 1932. [xi] “Death Great Preacher, Teacher, Priest Tells Riphon Mourners” Wisconsin State Journal. May 18, 1932.